Home > How much are paving stones? Here at Paving Stones Direct customers often ask us how much paving stones cost. Well, there is no definitive answer as the cost depends upon the type of paving required and the size of the area in need of paving. However, one thing is true, Paving Stones Direct has beautiful, quality paving to suit all styles and budgets. 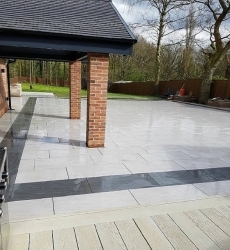 From hard wearing economical paving right through to more luxurious paving you know that with Paving Stones Direct you will get the very best quality at the most competitive price and, with our clearance sale now on, there has never been a better time to buy your paving. We have an extensive range of granite paving which is hard wearing and comes in a wide range of colours. Prices for granite paving range from around £306 to £335 per 10 square metres. We also have a huge selection of traditional stone paving varying in price from our Sawn Mint Sandstone which starts at just £285 for 10 square metres through to our Sawn Buff Sandstone offering a more luxurious contemporary finish at £432 for 10 square metres. Our vitrified porcelain range of paving is slip resistant and very hard wearing and starts at around £680 for a generous 21 square metres. For our more discerning customers we also stock a sophisticated carbon porcelain which is priced at £875 for 21 square metres. 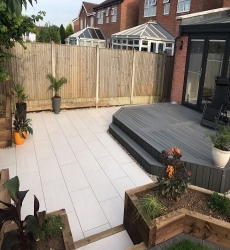 We can also provide packs containing mixed sizes of porcelain paving stones to allow our customers to achieve a more 'random' look when laying their patio. Our slate paving is suitable for both indoor and outdoor use and comes in a variety of shades of rustic, grey or black. 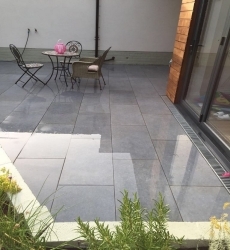 Our natural slate paving starts at £259 for a generous 20 square metres. We also stock a huge range of driveway block paving ranging in price from the more economical Willow natural stone block paving at £310 per 7.5 square metres to our silver granite block paving which costs £345 for 7.5 square metres. We also stock traditional sandstone cobbles at an amazing £550 for 20 square metres. Whatever style or colour of paving you require we are confident that we can suit your needs. Ordering online has never been easier and with our easy to follow laying guides you can soon be the proud owner of a beautiful new patio, driveway or path guaranteed to enhance the look of your home and add to its value. Call Paving Stones Direct today on 0800 047 0427 or email us at sales@pavingstones.co.uk and our dedicated team will be happy to help with any queries.